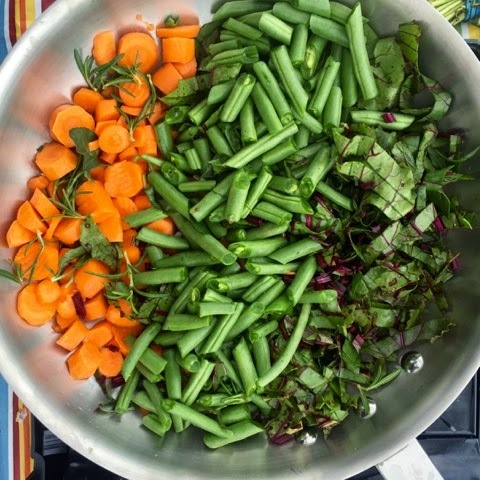 It was, what it has so infrequently been as of late, a sunny afternoon at the Texas Farmers' Market at Domain, and this bright and lively salad was a perfect pairing for the parting clouds. Simply a riff on a traditional scampi made with shrimp, you'll find this calamari version to be even more simple to prepare than it's inspiration. This hearty entree salad is filling, and versatile-- feel free to add and subtract ingredients according to your preferences-- the addition of red onion, artichoke hearts, young green beans, cherry tomatoes-- they all sound tasty, and save for the lemon, wine, garlic, and calamari, the sky is the limit on variations should you find yourself short on shopping time and an ingredient or two. My favorite dishes are flexible ones. They know who the boss is around my kitchen and they yield willingly to her tastes. Make sure they yield to yours, too. Saute garlic, scallion, and sweet pepper in grapeseed oil until just tender crisp. Remove, reserve. In same saucepan, soften butter over medium heat. Stir in parsley, capers, lemon juice, and white wine. Stirring occasionally, maintain at a low boil and reduce liquids-- about five minutes over medium to medium-high heat. Add calamari rings. Cook until just opaque, 2-3 minutes, stirring frequently. Remove pan from heat. Mound field greens on dinner plate. 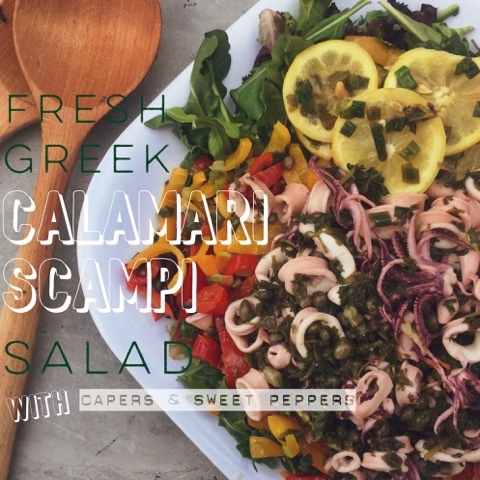 Top with sweet pepper mixture, calamari mixture, and ladle butter lemon sauce over salad. This substantial entree salad will be sufficient for a full meal, however if you'd like to serve something alongside, how about a warm-weather soup with Greek flavors to complement? If you're a bit of a lemonhead like me, Martha Stewart's Avgolemono, a traditional Greek egg and lemon soup, is prepared without the addition of chicken meat, just the broth, and would make a nice addition. If that's a little bit of lemon overload for your palate, how about David Chang's Tomato Soup with Olives, Feta and Cucumbers, his personal take on the traditional Greek salad, in soup form. Or maybe leave the salad's theme altogether and try Pinch My Salt's Creamy Chilled Cucumber and Avocado Soup. If you're feeling ambitious, maybe you'd like to try your hand at some traditional Greek breads, like this Horiatiko Psomi, a crusty country-style bread, or Eliopsomo, a Greek olive bread. Buying seafood in season from reputable fishmongers who embrace healthy harvesting guidelines is one big step towards ensuring you are consuming, and supporting, sustainable seafood. Learn more about these guidelines and practices from Oceanwise. 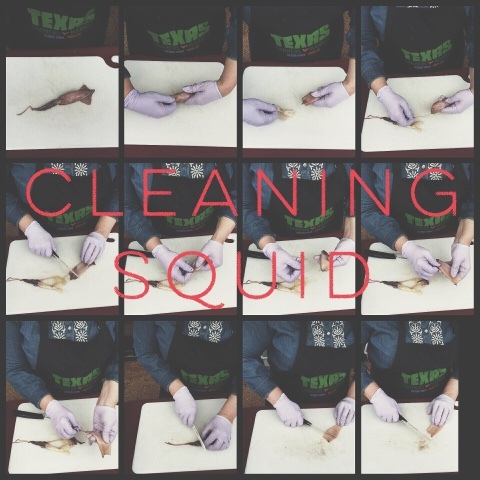 Need help cleaning squid? Well pop on over to this quick DIY tutorial and you'll be turning out rings and steaks in no time. It's really very simple. For more ways to prepare calamari, take a look at Farmers Market Favorite: Mediterranean Lemony Calamari with Stewed Tomato, another quick meal made in under 30 minutes, and look for the upcoming Pan-Fried Crispy Calamari on a bed of Heirloom Tomato and Basil Microgreens, soon to make it's appearance here on Notes from Maggie's Farm. Seafood is such a cinch. A few fresh ingredients, some seasoning, a little bit of heat, and a sharp knife-- that's really about all it takes to have an elegant tasty entree in scant minutes. 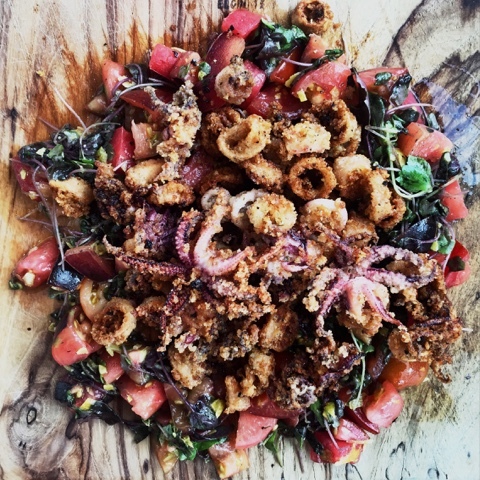 Squid are in season in the water, and the Texas Farmers' Markets are lucky to have a fresh-from-the-Gulf resource in K and S Seafood. They carry everything under the sun, or waves as the case may be, and also take pre-orders. Stop by the market soon and meet the fishmongers. And if you're not in the area, seek a local fishmonger of your own. These are the guys in the know, and they can be one of the most important people in your arsenal of food resources. They'll make you look good. Ask questions! Find out what the freshest catch is, the best of the season, how to clean and prepare, what a classic preparation of your particular choice might be. Forging these types of relationships are the best way I know how to become a seasoned cook. And the thing about market-fresh ingredients? Well, heck, you just don't need much of them. They shine all on their own. When I get to the market for a chef demo, I come without a recipe. 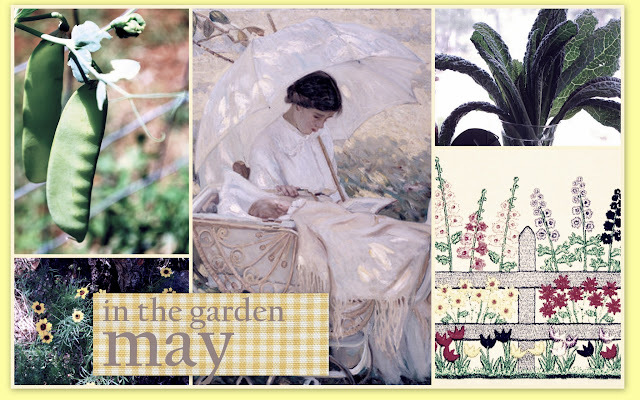 I simply choose the freshest and best of the day, and let it inspire my preparation. 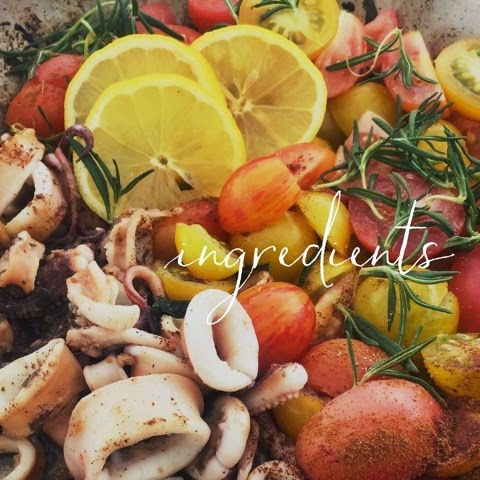 Here, early tomatoes are making appearances at the market, and these heirloom beauties from Bernardts Farm, along with that fresh squid, and the availability of fresh herbs suggested the Mediterranean to me, That's the direction I headed. Does the addition of cinnamon surprise you? It would have surprised me too, before studying flavor principles of regional food. I began my education with one particular cookbook I can recommend, Ethnic Cuisines by Elisabeth Rozin. It's a good, basic, starting point--one in a trilogy I hope to eventually acquire-- sharing the most common flavor combinations in popular regional cuisines. 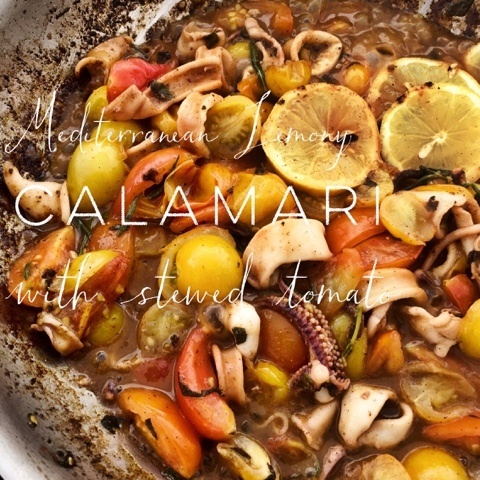 In this case, the classic Mediterranean combination of tomato + cinnamon + lemon is featured, and rosemary and garlic are frequent additions. Southern (American) regional cooking borrows the tomato cinnamon profile traditionally in stewed okra and tomatoes, too. Learning tried and true flavor principles is another learned skill of accomplished cooks and will go a long way in helping you get quick, delicious meals on the table with minimal fuss or recipe hand-holding. 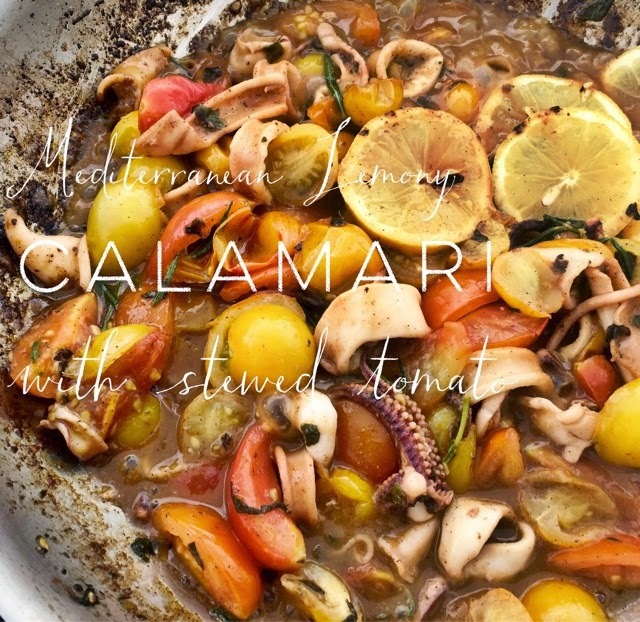 In a saucepan over medium-high heat, warm grapeseed oil to shimmering, and add calamari rings, stirring frequently, until just opaque, about 1-2 minutes. 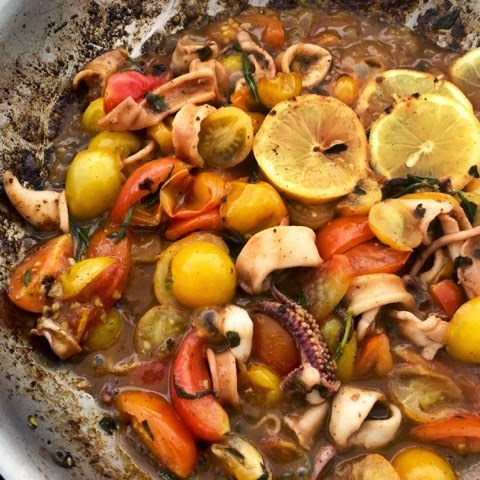 Add cherry tomatoes, garlic, lemon slices and cinnamon. Reduce heat to medium, and cook, stirring frequently, until tomatoes begin to break down and release their juices, about 5 minutes. Add the juice of half a lemon, return the heat to medium high, and allow to deglaze the browned bits on the bottom of the pan, about one minute. Stir to incorporate. No, really. That's it! See? A total cinch. A few serving suggestions: You can certainly serve this as it is, as an entree, perhaps with a side of steamed green beans or broccoli raab and a nice, crusty piece of bread to soak up the lemony broth. 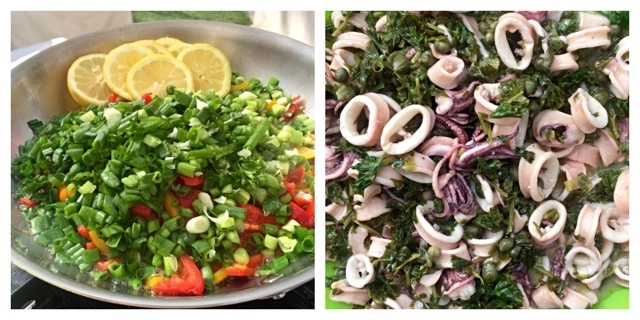 Or you could serve it over orzo, a Mediterranean rice-like pasta, or you could nestle it in a bed of lightly-wilted fresh spinach, perhaps with a little garlic and lemon added to the saute' pan to intensify the depth of those flavors in the calamari. You could also toss it with a sturdy salad green like arugula, add a sprinkle of good feta cheese, and eat that main dish salad with a glass of crisp, dry white wine. Wait. Ditto that wine for the other suggestions, too. Learn more about pairing wines with Mediterranean food here. This dish was prepared for the Texas Farmers' Markets Lakeline. If you're in the area on Saturday mornings, you might just find me there. See you at the markets! These are the days of farmers market abundance-- the warmer days of late spring yield the first basil, beans, early tomatoes, and more, while the not yet hot-as-blue-blazes garden still provides root vegetables and too-early-to-be-bitter greens. 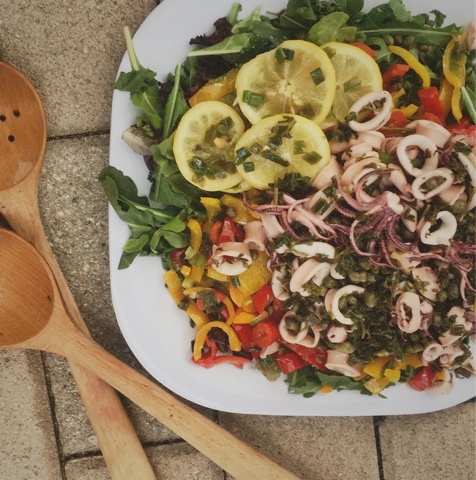 With little more than a simple dressing, the salad bowl explodes with full flavor and riotous color. Simplifying the task even further, we're utilizing local food producers' prepared pesto and aioli-- because they're as fresh as if we'd made them ourselves. 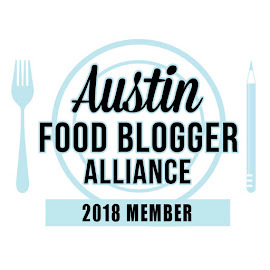 You can find Kala's Kuisine prepared Spinach Walnut Pesto and Stellar Gourmet Foods prepared Aioli at Austin-area farmers markets, if you're lucky enough to live close by. If not, your own local markets might be a resource, or you may choose to make your own. This pesto, and this aioli, are good recipes with which to try your hand. After visiting with your favorite local farmers, return to your kitchen with a colorful, abundant market basket bounty, and throw together a simple salad you can munch on for days. Prepare vegetables by scrubbing well and patting dry with toweling. Peel carrots, slice and reserve. Chop 2 T of carrot greens and add to a large salad bowl. 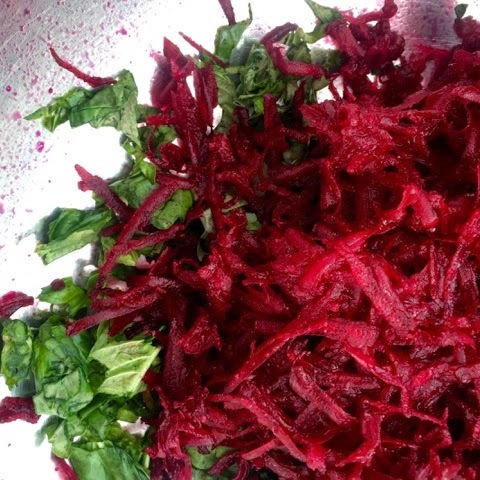 Coarsely grate beet root into salad bowl. 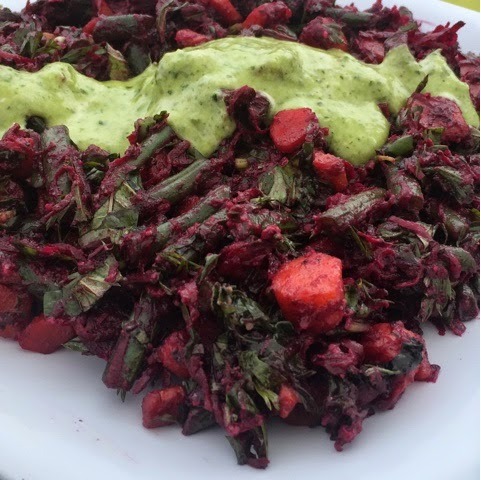 Chop beet greens finely and reserve. Trim ends of green beans, slice into 1" lengths, reserve. Chop basil finely and add to salad bowl. 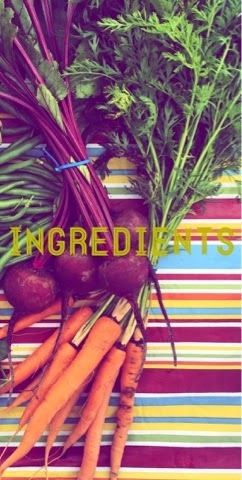 Heat grapeseed oil to shimmering, add carrots, beet greens, green beans. Sauté until carrots are crisp-tender. Add lemon juice to pan, stirring vegetables well and incorporating any browned bits released from pan, for 2-3 minutes. Remove from heat. Prepare dressing by combining pesto and aioli, adding a bit more oil if necessary to thin. Adjust seasonings with salt and freshly ground black pepper to taste. Transfer sauté to salad bowl, toss with remaining vegetables, stir in dressing, and serve. 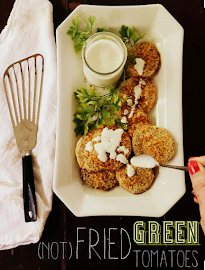 If you'd like to add a little more protein to the meal, might I suggest topping the salad with a handful of crushed toasted hazelnuts, a perfectly-poached farm egg, a simply-seared filet of fresh tuna, or if you're feeling ambitious, and a tad more indulgent, perhaps a panko-crusted pan toasted round of chèvre? This recipe was prepared for the Texas Farmers' Market Lakeline. Disclaimer: I prepared this entire post on my telephone with the Blogger app. I used the Afterlight and Over apps for photo editing and text. If it looks great, let's say I'm genius. If it looks sad, let's blame the apps. M'kay? Thank you. 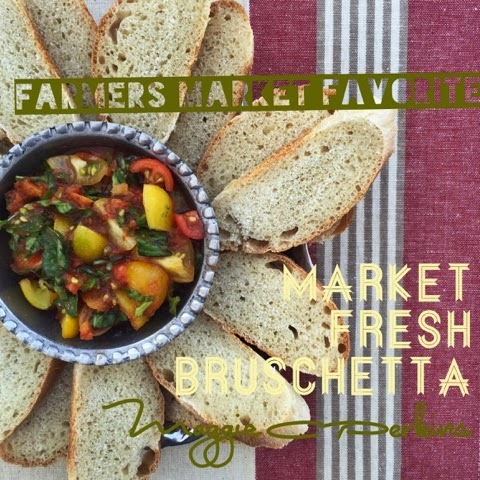 Bruschetta (pronounced broo- SKET-uh) is a quick and simple fresh bite, perfect for a light lunch or an appetizer, for one or a crowd, showcasing the season's very best. 1. The correct pronunciation. It's BruSKETta, not BruSHETta. I know I've said it twice, now. It bears repeating. And again. 2. Bruschetta is actually the toasted or grilled bread, prepared simply with a drizzle of olive oil, a light pass of a garlic clove, and perhaps some coarse salt. The toppings served in many restaurants might run from the basic, to minor theatrical productions-- four courses on a slab. Traditionally, toppings are kept simple. 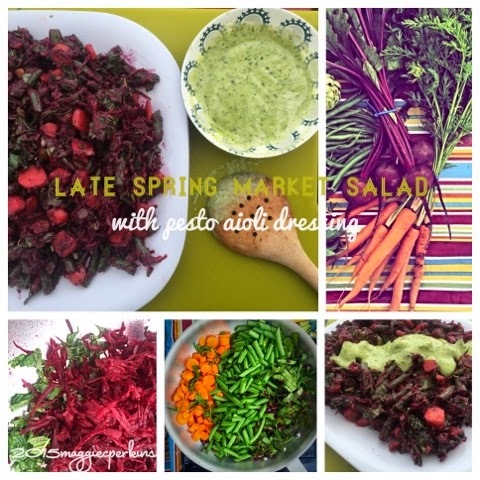 The salad topping below tries to stay true to the original spirit, while letting the late vegetables of Spring show off a bit. Combine all ingredients, above, and allow to sit for 20-30 minutes at room temperature. Cover a large baking sheet with bread slices. Drizzle extra virgin olive oil, lightly, over all. Toast under broiler until golden, turn and toast opposite side. Remove from oven. Spear garlic clove horizontally with fork tines. "Paint" each slice with the whole clove while bread is warm, on one side. Note: No stove? No problem! Simply pan toast in a heavy pan (cast iron yields best results) on the stovetop (but not a pan of a nonstick variety, which would prohibit toasting). Traditionally, bruschetta has been grilled, so certainly utilize the barbie if you're cooking al fresco. Mound salad atop toast. 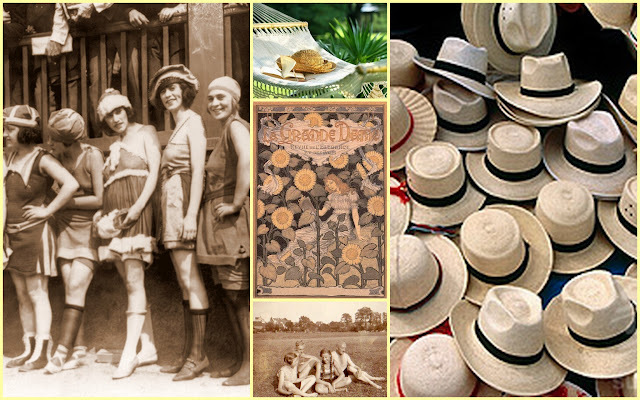 Alternately, serve toasts around a bowl of salad for diners to serve themselves. This is the month that all your hard work in the garden begins to pay off! Dinners of spring greens and green garlic, and sweet peas with caramelized onions. 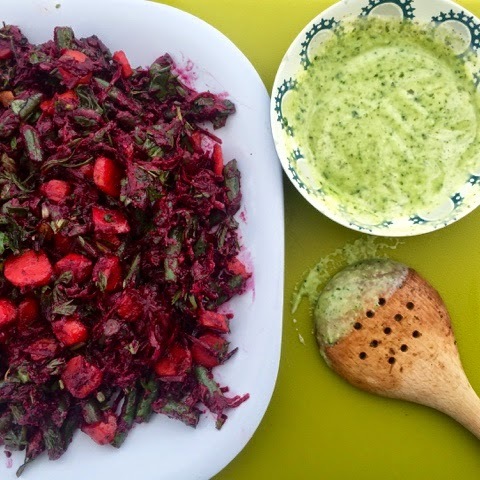 Cabbage prepared every way imaginable--and home-fermented sauerkraut is this weekend's project. 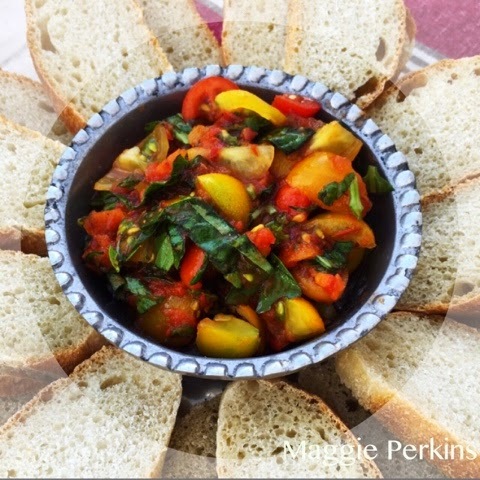 Looks as if tomatoes and peppers and squash will be showing up on my table this month, so I'll add homemade pasta to the farmers market shopping list, and making mayonnaise, pesto, fresh whole grain bread and herbed focaccias will fill the list for weekly kitchen tasks. It's going to get awfully sunny and steamy around these parts, every day, really soon. 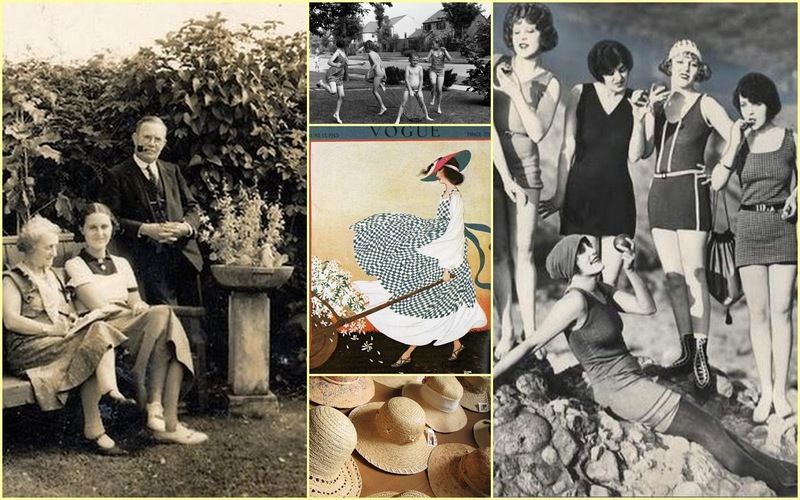 Shake out your swimsuit, air out the lawn chairs, bust out the sprinklers, unearth your straw hat.....Summer's right around the corner! 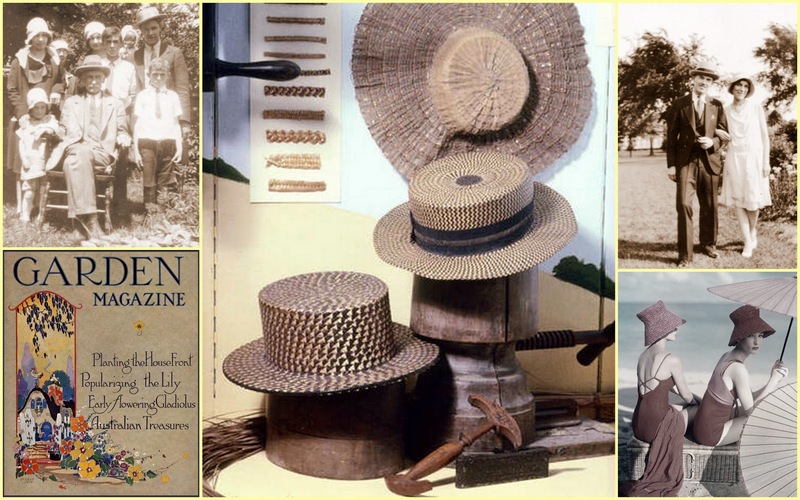 Gardening information courtesy of the Garden Guide for Austin & Vicinity, published by the Travis County Master Gardener Association. It's that glorious season in the sea for one of my favorites-- soft shell crab, the blue crab in its molten state, and I had the opportunity to share these succulent treasures with the Texas Farmers' Markets this weekend, courtesy of my friends, K&S Seafood. They need little more than a well-seasoned dredging, and are simple and quick to prepare. They typically come into season when they shed their winter shell, around the first full moon in May (and as I write this, I see that very moon shining brightly outside my window), and will remain in season through September, generally.Check with Scott, or your local fishmonger, for availability. Soft shell crabs are often marketed by size, measured across the back from point to point, and vary in width from about 3 and 1/2 inches to as large as 5 inches breadth. It takes only a few hours for the shedding of their shell to occur, at which point they are removed from the water to prevent the formation of the new exoskeleton. They have a sweet, mildly tangy flavor, with a slight tooth to the emergent shell similar to tender sausage casing, with buttery meat sandwiched between. A 3 and 1/2 ounce crab contains only 83 calories, is low in fat, and high in protein and Omega-3 fatty acids. The lightly dredged and pan-fried crabs were served along side cheesy, creamy polenta, prepared with OrganicareFarms coarse-grind organic cornmeal, who also provided finer-ground cornmeal for dredging the crabs, as well as cured ham steaks which seasoned Smothered Collard Greens, prepared with spring garlic, and spring onions, all from the fields of JBG Organics. Additional market vendor products used were Dos Lunas cheese, and Texas Hill Country Olive Co. Balsamic Vinegar. 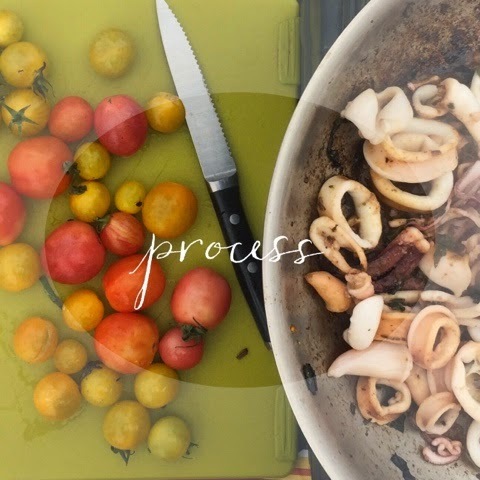 For helpful instructional videos on cleaning soft shell crabs, cooking polenta, and cleaning and preparing collard greens, please visit last week's preparatory post on Notes from Maggie's Farm. In a large mixing bowl, combine cornmeal, salt, cayenne pepper, and black pepper, mixing well. In a heavy skillet, heat oil over medium high heat until shimmering. Drop a pinch of cornmeal mix into skillet—oil is hot enough when cornmeal sizzles. Adjust heat as necessary. Add dredged crabs, top side down, leaving enough space to move the crabs around freely, about 3 at a time, according to size. Fry about 4 minutes per side, turning midway through, or until blue “shells” turn red, and cornmeal is golden brown. Remove from heat and drain on paper toweling. Note: Find instructional video for cleaning soft shell crabs here. In a Dutch oven, bring stock, water, salt and white pepper to a boil. Slowly pour cornmeal into water, whisking briskly to avoid clumps. Cover and cook for approximately 45 minutes at a low boil, stirring occasionally. Add liquid as necessary, to maintain creamy texture. When cornmeal is tender and creamy and has lost its “grit”, stir in cheese and olive oil, whisking until smooth. Note: For helpful hints in preparing polenta, see instructional video here. Pat cleaned and trimmed collard greens dry and set aside. In a heavy bottomed pan, cook chopped ham slowly, rendering fat over medium low heat. When firm, add grapeseed oil to rendered fat to make approximately 2 tablespoons. Add minced garlic and sauté with ham, stirring frequently over medium heat, until golden. Remove from skillet with a slotted spoon and reserve. Add enough grapeseed oil to pan to yield approximately 2 tablespoons. Sauté sliced onions with sliced collard green stems until wilted. Add shredded leaves to pan, and return ham and garlic mixture, combining all well. Season with salt, red pepper flakes, and balsamic vinegar, stirring well. Add stock or water to pan, bring to a healthy simmer, cover, and cook until wilted, about 20 minutes or to desired tenderness. Correct seasonings. Note: For instructional video on cleaning and trimming collard greens, visit this link. 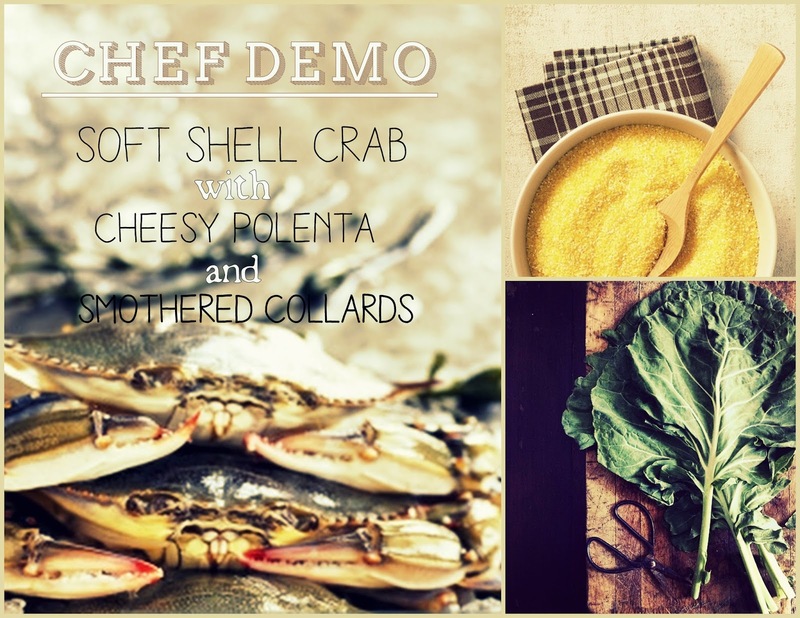 To serve, mound polenta on plate or rimmed soup bowl, spoon collard greens in the center, and top with freshly-fried soft shell crabs. Enjoy. If you're in the Austin area this weekend, come join me at the Chef Demo tent, Texas Farmers' Markets, on Saturday at the Lakeline location from 10am-12noon, and Sunday at the Mueller location from 11am-1pm, for what promises to be a delicious dish. Softshell crab, one of my favorite things in THE WORLD, is in season right now, and K&S Seafood will have plenty on hand. They're giving a few up for lucky market-goers to taste and learn how to select, clean, and prepare these tasty treasures. They'll be served with creamy, cheesy, cornmeal polenta, courtesy of Organicare Farms, who will also share their delectable cured pork for the accompanying smothered collard greens, also from the market. 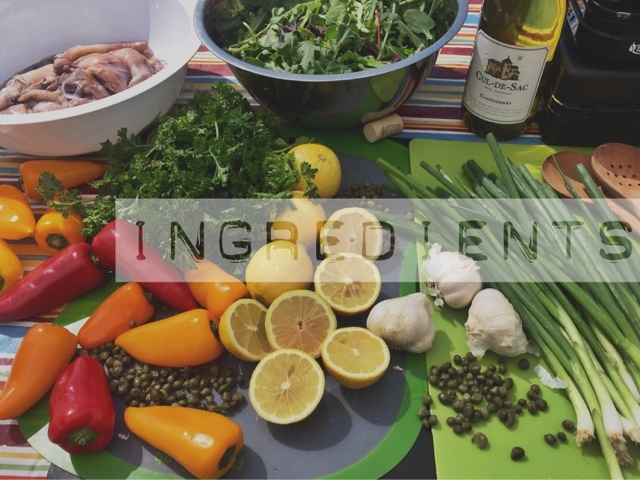 You'll be able to select all of these ingredients from market vendors to duplicate your own meal at home. 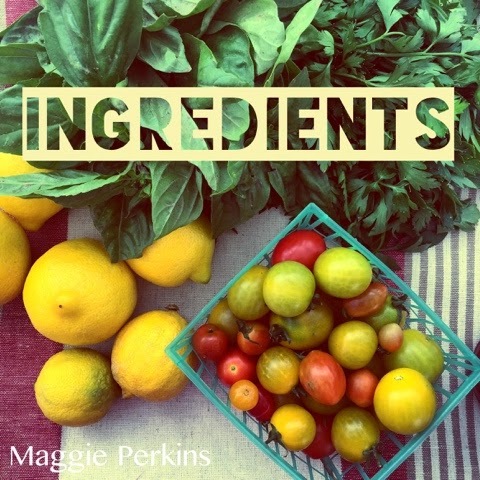 Look for these recipes on Notes from Maggie's Farm next week. If you'd like to get a head start, and learn a little more about each component of the dish, check out these handy videos, below. I hope to see you at the markets!